Use Artool Texture FX Freehand Templates for creating unlimited textural possibilities — rocks, stone, splashes, animal skin, and so much more. Designed by Gerald Mendez out of Chino, California, a master airbrusher and Disney Company digital illustrator, they let you add organic textures and hyper-living qualities to your artwork in minutes instead of hours. Artool Texture FX Templates are produced using a special polymer-coated material and are solvent-resistant. With proper care and without folding, Texture FX Templates withstand years of repeated use. Full size templates measure approximately 8" × 11" (20 cm × 28 cm). 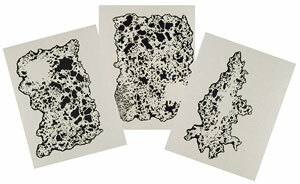 Mini templates measure approximately 5" × 7" (13 cm × 18 cm). ®Artool is a registered trademark.® Freehand is a registered trademark. ™ Texture FX is a trademark. ® Disney is a registered trademark.